FANNY FAT, 70: Nearly blind from glaucoma, this Asian-born matriarch of the Pressure Drop Club loves candy, pizza and teenagers. Fanny has the hots for SLOOP KRAZELBAUM, 18 (Morris's grandson David's neo-hippie, dreadlocked friend) and enjoys boogying with him at seedy NY dance clubs. It is she who helps soothe Morris's initial fears of marijuana as medicine when he first arrives at the Pressure Drop Club. 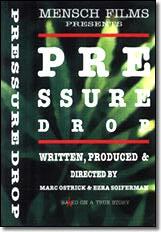 In 1993, Marc Ostrick and Ezra Soiferman embarked on the first phase of the PRESSURE DROP journey. Together, as New York University undergraduate film students, they penned the script for the short film version of PRESSURE DROP and produced it in Professor David Irving's Color Sync Workshop as their Tisch School of the Arts Senior Thesis Film. The controversial comedy features Morris Potashner, the little old Jewish grandpa who refuses to have the operation for his glaucoma-induced eye pressure and opts for a rather lesser known treatment: marijuana. Much to the chagrin of Ida, his wife of fifty years, Morris attends an established New York City "outpatient self-help clinic" which turns out to be a multicultural senior citizens' pot den. Within the den's lush jungle of lava lamps, power-bongs, hippie tapestries and four insanely stoned-out seniors, Morris discovers that getting old isn't quite as easy as getting high. Eighteen film festivals and a Warner Bros. Pictures Film Production Award later, the eighteen minute movie has emerged a cult favorite at college dorms, office parties and senior citizen centers across the US and Canada. Young and old alike can't help but take note of the loveable Morris Potashner and his medical-marijuana-puffing entourage at the Pressure Drop Club.